About two months ago I saw an article in our local Dialysis and Transplant Magazine, Shoestring, about Ros and Charlie, who had installed a dialysis machine in their caravan, so they could travel the country. Wow, I thought, what a great idea! But what about all those things we take for granted in our unit or at home: support, water quality, cleaning, dealing with the consumables, etc? Luckily, Ros dialyses now and then at our unit, so I jumped at the chance to ask her to write a guest post all about setting up and touring in her dialysis caravan. She gracefully agreed, and here it is. I have a long history of renal disease, and after my transplant failed, I was again on dialysis. This time although on the transplant list for another kidney, I am very difficult to match up and had to accept that my life may only continue with dialysis. Consequently over the years of dialysing I have become actively involved in the renal community, being involved with the kidney health consumer committee, several government committees and the Dialysis and Transplant Association (DATA). This is a volunteer-run organization that has two very nice, very affordable holiday homes in holiday spots, Rosebud, by the beach, and Yarrawonga, on the Murray River. Both houses are equipped with dialysis machines and both the local hospitals have a holiday chair to cater for the holiday maker. The most frustrating aspect of holidaying is finding a dialysis unit that can fit you in for a holiday. For myself, I have managed to have a number of holidays, not only in the DATA homes but at Myrtleford, Orbost, Sale, Dubbo, Lorne and Darwin. It is a matter of ringing the dialysis units and hoping there is a dialysis spot at the time that suits. 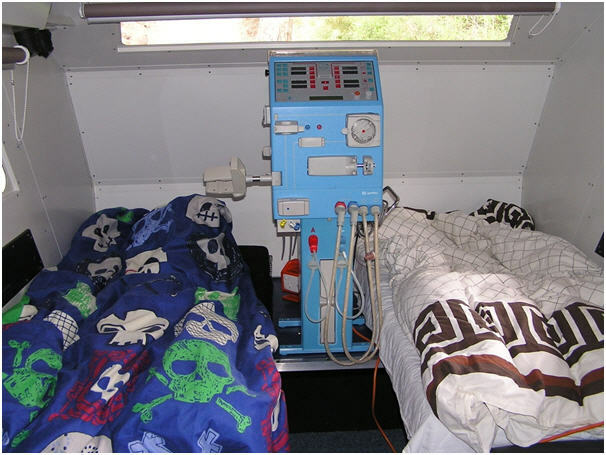 I then started hearing about people who had put dialysis machines into caravans, making it easier to holiday. So I am by far not the first to do this. Prior to dialysing, my husband Charlie and I travelled the land, and loved to camp, mainly in the high country. With my eyesight deteriorating I was determined we would travel again. We took some time to choose our caravan (we went to a few caravan shows to work out exactly what we wanted). 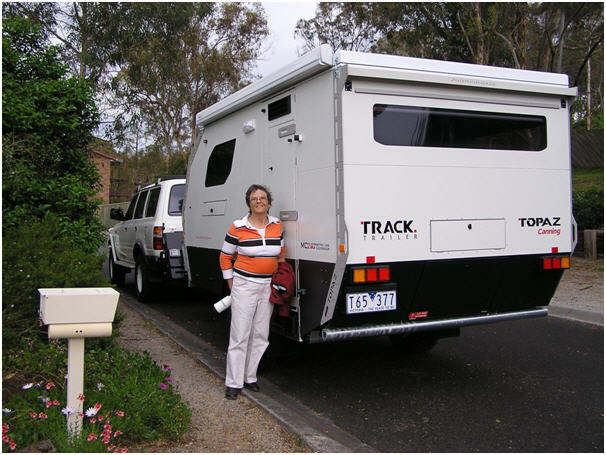 We decided that we really wanted to be able to visit out-of-the-way places, such as the high country again, so we chose an “off road” caravan – the Topaz made by Tracktrailer. Once we found the caravan, we asked Tony (head technician of Austin Renal Unit) to take a look at it and see where we could fit a dialysis machine. Being a small caravan, we decided to turn the double bed into two single beds and have the machine in the middle at the front for better weight distribution. 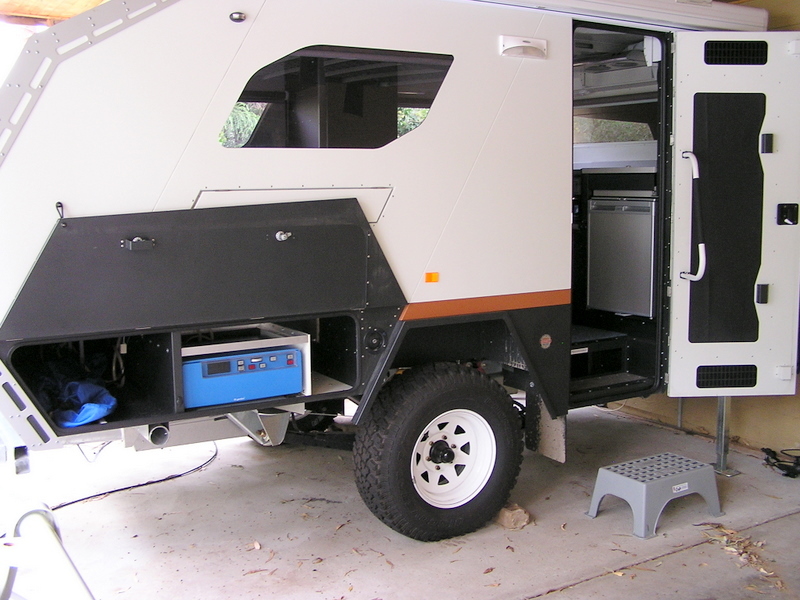 My Machine Nestled Inconspicuously Inside Caravan. It was relatively easy to turn the bed into two singles because there was storage under the bed where it was cut down to size. Charlie did this over several weekends, and being a good handyman had no problems with it. Our next step was to get a machine. Luckily, the Austin Renal Unit was upgrading their dialysis machines and sending the old ones to Chile. The Reverse Osmosis System in place. The tecs kept one back and cut the wheels and base off so it would fit into the van better. Their main concern was the water quality in the places we intended to visit, so to ensure it would do the job, they took lots of measurements of both the machine and the Reverse Osmosis (RO) water purification system. They gave us a testing kit to ensure that there was not much chlorine in the water after it had been through the filters. Apparently, this is an indication that there is a lot of bacteria which is being treated with chlorine. These filters filter the local water supply before it goes to the machine. They also fitted a much longer filter to ensure that the chlorine was filtered out. Charlie had an old steel roof rack that he cut up and made frames to fit the machine into, to help keep it stable. The RO was put into an outside cupboard and water lines, power lines were run under the caravan and through a small hole in the floor. This took another couple of weekends, as Charlie was working and only had weekends to do it. After a couple of months preparation, our travelling machine was ready for a test run or two. It is certainly an advantage that I normally dialyse at home, as there is very little change to the normal dialysis procedure. I normally dialyse overnight every second night at home, and I do the same on the road. Our first run in the caravan was in our carport at home, and it went well. We then graduated and I dialysed at my parent’s house who live in Mansfield (about 180 km – 110 miles away). That went well too. Our plan was then to visit Mildura and Broken Hill, a round trip of about 1,700 km or 1,000 miles. 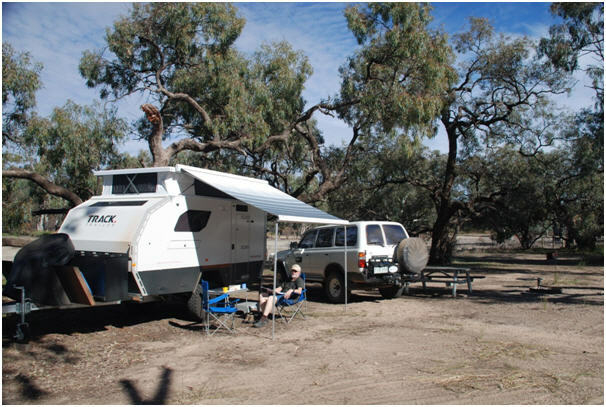 We spent 4 days in Mildura and a week in Broken Hill, staying in caravan parks. Both parks were happy for us to use lots of water to dialyse, and both water supplies tested well for dialysing. In regard to preparation before a trip, because the machine gets used intermittently, we ensure it gets disinfected before we set off. Bedsides this, there is no extra maintenance required. Regarding consumables, for short trips, we fill the back of the Landcruiser. When we plan big trips we arrange for the consumables to be delivered to the nearest unit and just carry enough to get us to where we are going. After use, we double-bag our consumables and put them in the rubbish bin, just like we do at home. I like to drop into Units along the way, to make sure that everyone knows about DATA and their holiday homes, and how easy and cheap it is to take a holiday. When we go on a long trip I may also drop into country dialysis units along the way if there is a slot available. This helps spread the workload and also to extend the length of the trip. I would like to thank Greg for asking me to write about our experience setting up the dialysis machine and our holiday. Our first long trip was a great success. It has given us the freedom to travel when and where we like. And we have only just begun. Roslyn. Posted on June 24, 2011 by dialyblog •	This entry was posted in Bus or caravan, Healthy dialysis, Holidays & Travelling on dialysis, Living the good life off and on dialysis. Bookmark the permalink. 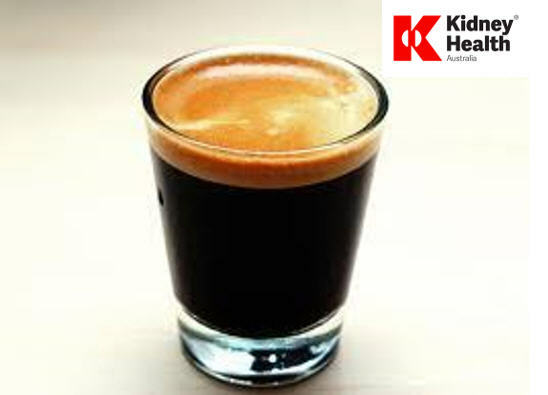 ← Dialysis through the night – giving you back your days? Great article and well done Charlie. What a fantastic article. It is amazing what the human spirit is capable of doing regardless of the adversity put in the way. Congratulations Ros, I had no idea you were doing this and taking control of your life this way. I think your article is very inspiring. I am not a caravan-er but the attitude you and Charlie have is incredible. May you have many memorable trips away in your caravan. Way to go Ros. Great article. I am dialysing on the NxStage which is transportable and can work off bags of dialysate. Ideal for camping etc. 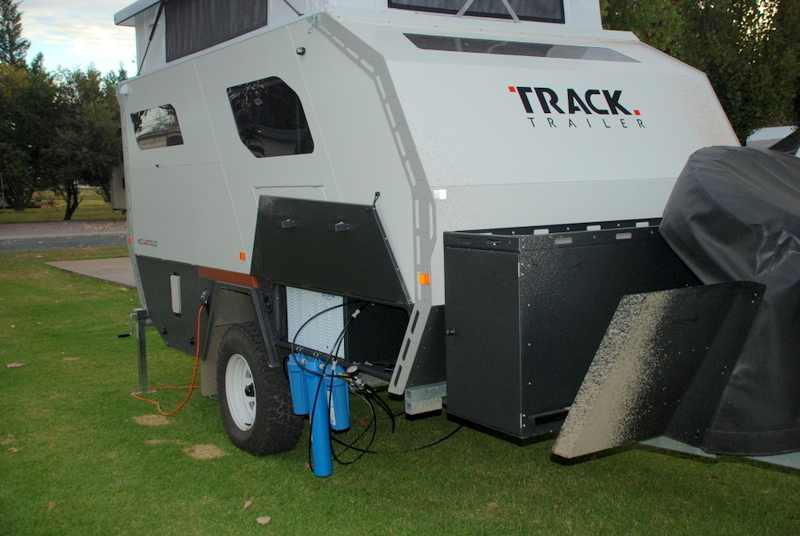 I understand that NxStage have just ‘signed-up’ in Australia and NZ, so there may be opportunity shortly to utilise this machine for travel there. It is gradually being rolled out across the UK here (i’m on number 35 apparently) and I am keen to see what can be accomplished for travel with this. One of the first guys to travel with it here went to Switzerland with the machine. In the US, one of the advocates on this machine travelled over 60k miles with one touring the various states. Good luck with your travels! CARAVAN TRAVEL WITH MY OWN DIALYSIS MACHINE SOUNDS JUST WHAT WE WANT. CAN ANY ONE SUPPLY MORE INFORMATION ON THE REQUIRED FILTERS, RO UNIT, WATER SUPPLY ETC THANK YOU FOR ANY DETAILS. Hi Tom, It’s Peter and Jill again. If you want to talk about caravan dialysis give me a ring or an email. We have been away from home for thirteen weeks in our van this year, but I might not be doing it again as I revieved a kidney 4 weeks ago and it is looking good. Hi peter and Jill, my name is Dean and I live on the Sunshine Coast and have just graduated to caloundra hospital as self care Dialysis patient. I Dialysed for approx 12 months in 1995 before receiving a transplant from my mum that gave me a good run off of Dialysis until April this year. Now back on dialysis I have the option of taking the dialysis machine home to dialyse. After reading about Ros and Charlie and your experience I am interested in setting a machine up in a caravan to turn my time on Dialysis as a positive to travel while not working. I would love to learn more about your experience and tips/challenges on how this can be achieved. All you need is a drain line extension and premixed hanging bags of your diaylisate solution, your portable cycler machine and needed supplies and a power source. That simple. You can even have supplies shipped to nearby centers or campgrounds when storage space is an issue. Hi Tom, have you ever gotten around to doing this? Hey there, I’ve been following your post since last six months and I must say I got so many useful information. Just letting you know Charlie and I have now been to far North Western Australia, Broken Hill, Coffs Harbour, Outback South Australia -Leigh Creek -great water it goes through an RO, cost $5million – we got to visit the RO station, – Alice Springs. Unfortunately the last 12months a few health issues have restricted our travels. We would like to visit the Pilbra but unfortunately water is of poor quality, and we can only carry enough water for 1 short run. Hi everybody, I have found this all very interesting. When my wife started on haemodialysis a couple of years ago, I Googled everything I could think of and found very little on this subject but decided it would happen for my wife. We have installed (not permanent) our home dialysis machine (Fresenius 4008B) in our van since updated with a little resistance from our home dialysis unit, but have been cross country a couple of times now. We do our stocktake as usual and they send our supplies to the address we supply. We have found this to be a great way to travel and can still go about the usual sightseeing etc. as Carol does her dialysis in the evenings. We started a Facebook blog “Dialysis on Wheels” so others could realise the possibilities and that dialysis doesn’t have to tie you down.